Do you have an affinity for Germany's cuisine and culture? While the idea of flying across oceans and exploring new countries and cultures may sound appealing, it can be far too costly for the average American family. Your vacation is a time to get away from the daily stresses and experience enjoyment. Forget the expensive airfare to fly to Germany and visit the town of Helen, GA instead. From the buildings to the mountains, Helen resembles a charming Bavarian village in Germany. What if you could experience the beauty and culture of the old world Germany right here in northern Georgia? When you book a stay at one of the fabulous luxury cabins in Helen, you will be able to enjoy a taste of the German lifestyle on a budget you can afford. Below we'll give you a closer look at how you can experience Germany and feel like a German throughout the year when visiting Helen. The Blue Ridge Mountains surrounding the small town of Helen are beautiful and awe-inspiring. Sit back, smell the fresh air, and get instantly transported to the Alps. A stay in Helen, GA cabins is the best way to truly appreciate the mountains. Within walking distance, there are all sorts of adventures awaiting you. 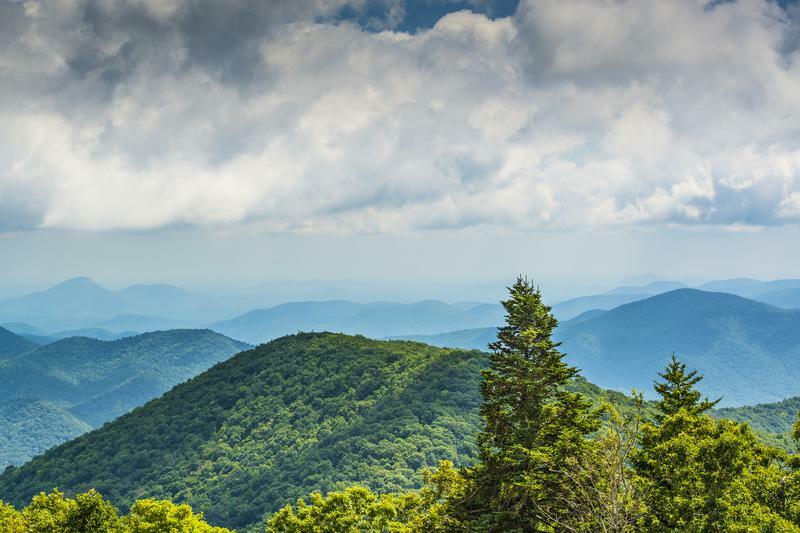 You can take a hiking expedition on the famous Appalachian Trail or rope yourself up to the steeper mountains for a day of mountain climbing. Gather your friends or family for a good time navigating through the rivers on a raft or fly through the trees rooted in the mountains on a zip line. Experience everything the mountains have to offer. 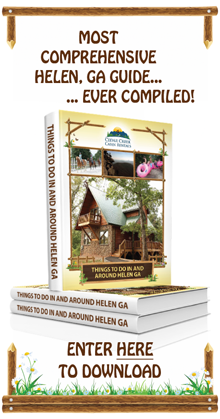 If you’re not the adventurous kind, look for Helen, GA cabins that provide you with gorgeous views of a mountainside. You'll wake up in the mornings breathing crisp mountain air and end your days listening to the sounds of the mountain while sitting on your porch sipping a glass of wine. Take short hikes on trails within walking distance of your cabin and enjoy flora and fauna of the Alps...I mean, the Blue Ridge Mountains. Years ago, Helen was a small logging town that was struggling to survive economically. The community decided to turn the whole town into a replica of a Bavarian alpine village in Germany to draw tourists. Every building was redesigned to display German architecture, and the townspeople added German restaurants, shops, and pubs. The setting of the town worked well with the Chattahoochee River and the mountains as scenery for all the visitors and residents; it reminded people of the rivers and the Alps in Bavaria. Visit Helen, and you'll smile at the white and brown architecture of the buildings covered in red roofs. Enter the shops and browse through the many German-inspired souvenirs and food items. Ride on a wagon pulled by horses and watch people float past you on tubes on the Chattahoochee River. You won't even have to close your eyes to imagine that you're in Germany. Your senses will whisper that you are in a place unlike any other in America. 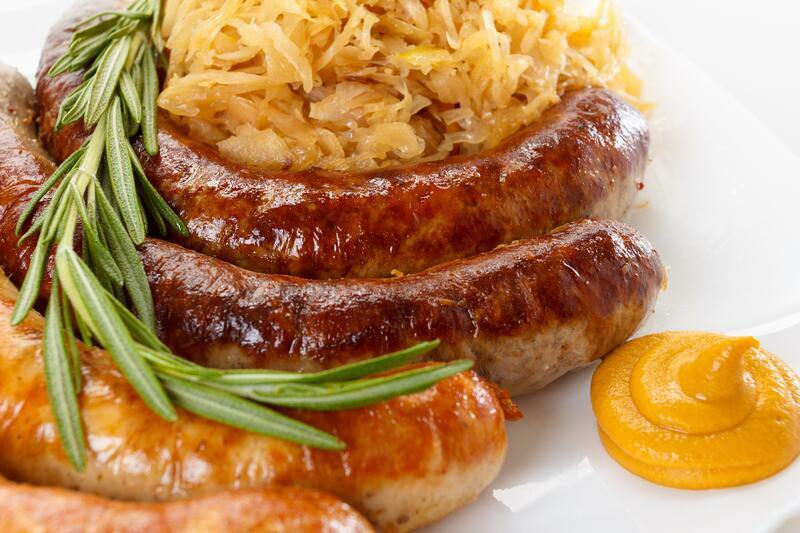 Germany is well known for delicious juicy brats and sausages, as well as sauerkraut and hearty potatoes. You can get all that and more in Helen. Numerous restaurants in town serve authentic German fare. Be sure to try dishes that are new to you, such as the spaetzle (a noodle dish) and the famous schweinebraten, a pork roast. Notable restaurants that serve German cuisine include Old Bavarian Inn Restaurant and Hofbrauhaus Restaurant. Don't forget to add a German beer to your dinner order! What’s a visit to Germany without a cold pint of fresh beer in your hand? When you stay in our Helen, GA cabins during the hot months, a cold beer could be the very best drink to quench your thirst, especially with the countless choices of delicious German beer in town. You'll find beer imported from Germany at many of Helen's locations, but don’t miss King Ludwig’s Biergarten and the Nacoochee Village Tavern. Helen is further transformed into a Bavarian town, thanks to Helen, GA Oktoberfest. If you plan your visit to Helen between the middle of September and the end of October, you will get to be a part of Helen's Oktoberfest - the longest running and largest celebration of it's kind in all of the southeastern United States! People come together for Helen's infamous Oktoberfest from all over to enjoy the German festivities. 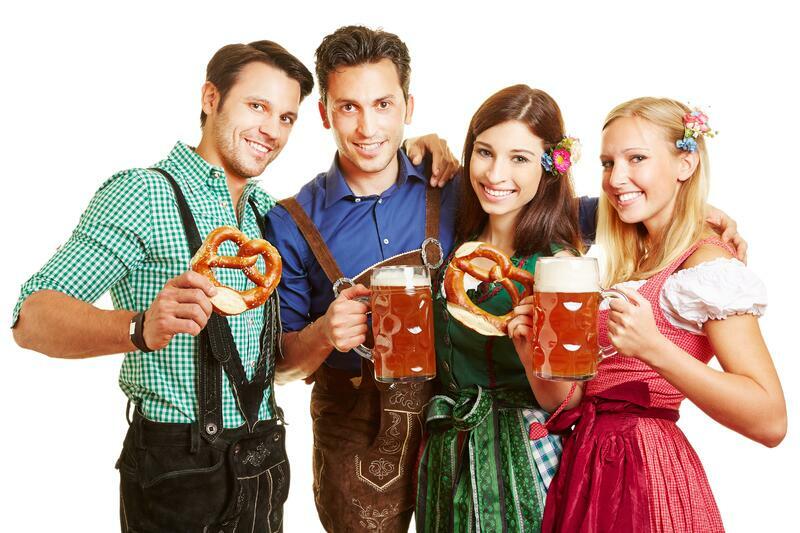 In addition to wetting your whistle with international, domestic, and local beer and wine flavors, you can satisfy your taste buds and tummy with delightful German cuisine like bratwurst, sauerkraut, strudel, and more! You’ll find women servers dressed in a dirndl, a traditional dress worn in Bavaria, and Oktoberfest celebrations. You'll also see band members wearing lederhosen, an outfit complete with knee-length breeches, suspenders, long white socks, and a jaunty hat. This is a time to sit down and enjoy Bavarian treats in the Alpine Helen Festhalle where visitors can gather and eat community style while enjoying live music. We bet you'll tap your toes and maybe dance all night long to the "oom-pah" of traditional German polka music. Who knows, you could find yourself drawn to the dance floor to do the popular Chicken Dance! The music, the dancing, and the beer will make you feel like that town in Germany was bottled up and moved to Helen, GA. Oktoberfest is an entertaining time to visit the town and stay in Helen, GA cabins. Just moments away from Helen you will discover the enchanting village of Alpine Helen. You'll feel as though you are whisked away to another place and time the instant you drive onto Main street. 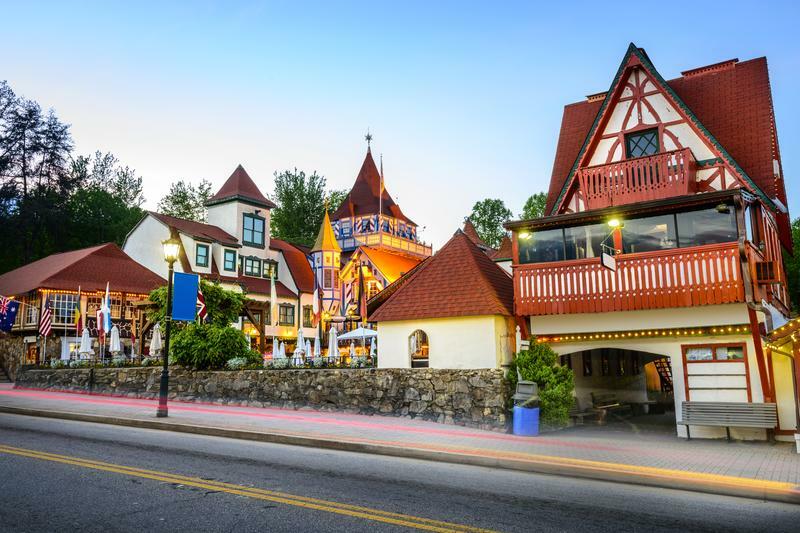 From the Bavarian style architecture to the winding cobblestone alleyways to the pleasant aroma of German chocolate and traditional dishes in the air, the city of Helen is a beautiful re-creation of Bavarian culture. You, your family or friends can enjoy people watching, browsing through the many Alpine gifts, specialty, and food shops, and tasting German delights in the many Bavarian cafes and bakeries. 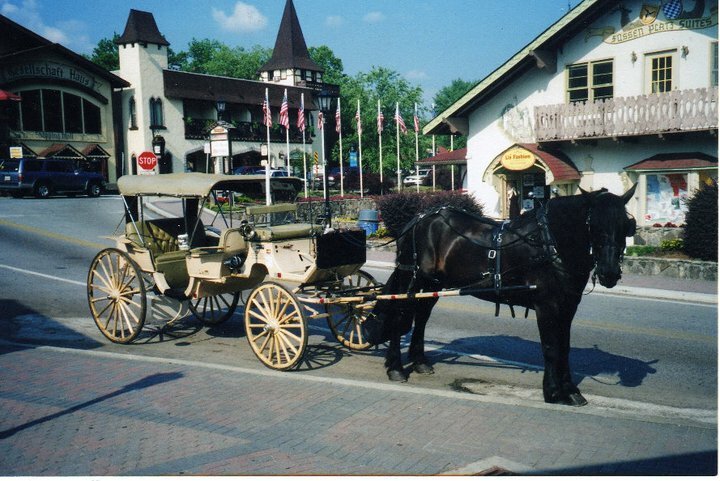 You can even explore the town on a horse-drawn carriage ride from the Alpine Carriage Company! Helen is an unforgettable experience no matter what time of year you choose to visit. In German tradition, volksmarching ("the people's march") is a form of non-competitive fitness walking that brings the young and old together to socialize and walk in the outdoors. During the Spring, visitors to Helen participate in the Helen Volksmarch which follows a marked path from the Festhalle to Unicoi State Park. 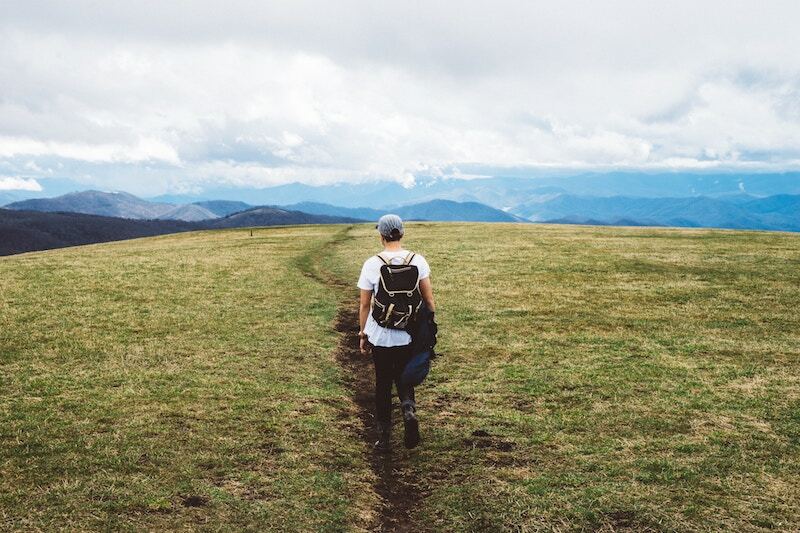 The 5-kilometer walk is a great way for locals and tourists alike to enjoy the beautiful countryside and meet new people while getting some exercise in the fresh mountain air. When you stay in Helen during the summer months, you will be entertained by the traditional Bavarian nights of summer - a northern Georgia favorite! From the middle of June through the end of August, visitors are welcome to join other tourists and locals in the Festhalle on Saturday nights for some German style celebration! 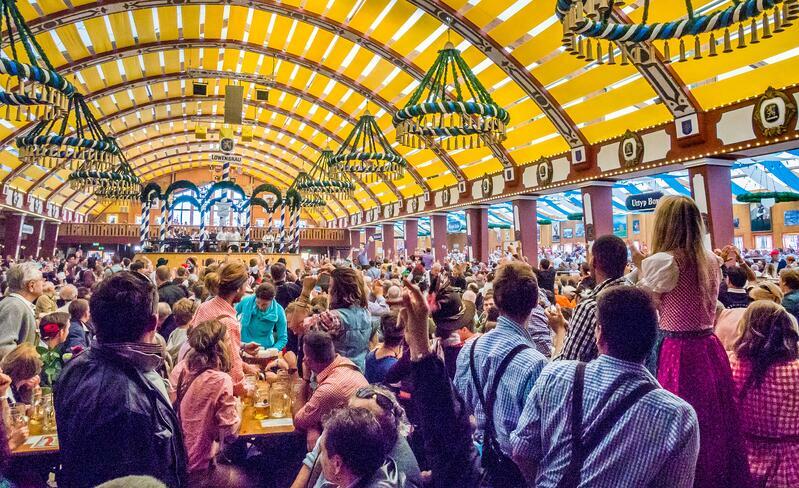 Featuring live music and dancing, the Festhalle is indeed the place to be for those who are looking for fun and the authentic Bavarian experience. 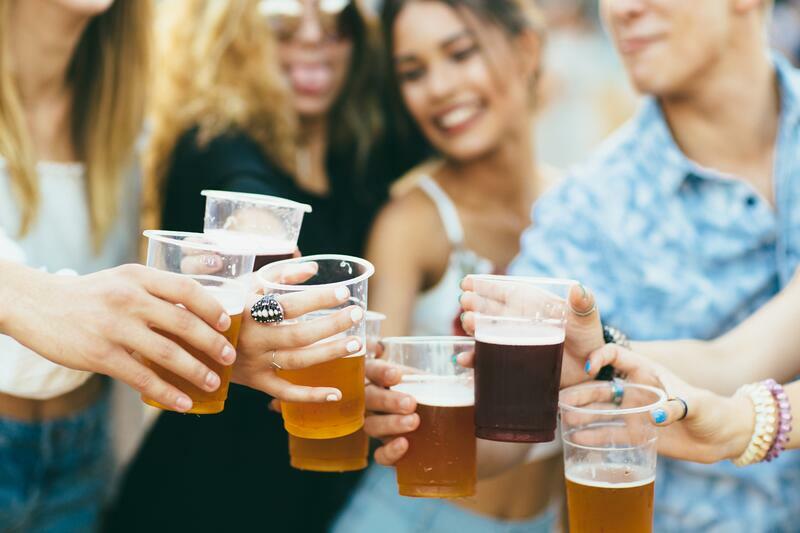 You can enjoy traditional German cuisine and beers as you tap your toes or dance to the music with your nearest and dearest. When you plan a vacation to Helen during the winter months, the snowcapped mountains and the lights of Helen during Alpenfest will captivate you. 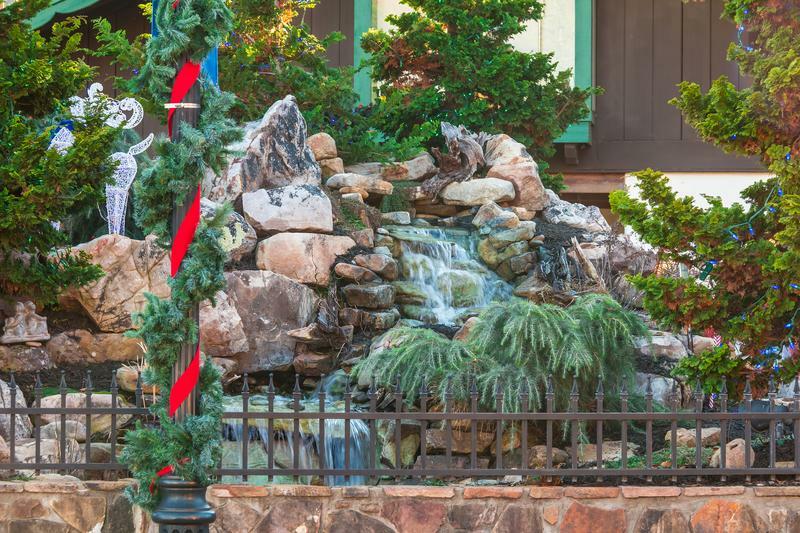 This wintertime celebration embraces the magic of the holiday season, creating an extraordinary place to be for locals and tourists alike. The glimmering Christmas lights, the annual festival of the trees, and a visit to Santa Clause will delight you and yours! Be sure to visit Christkindlmarkt - a German holiday tradition! You will find vendors selling unique holiday gifts and ornaments from booths in downtown Helen as you enjoy the flavors of sweet and savory treats in a magical holiday atmosphere. Whether you’ve already visited Germany or you would like to someday, you’ll find everything that you’re looking for right here in Helen. Have you visited Helen during any of these Bavarian celebrations? What tips do you have for future visitors? Please leave us a comment below. And if you're looking for other reasons to book a vacation in Helen, check out our FREE Oktoberfest Guide below!